British doctors are working as part of a massive international effort to help those affected by Typhoon Haiyan, which hit the Philippines with devastating force on 8 November. The storm has long since passed, but the medical and humanitarian situation is constantly evolving. "We are mostly seeing trauma and fractures right now… but in week two going into week three you start seeing an increase in patients with chronic conditions," says Dr Julie Hall, the World Health Organization's (WHO) representative in Manila. Post-disaster conditions create the perfect environment for the spread of disease. Contaminated water supplies are the biggest problem, putting huge numbers of people at risk of water-borne diseases like cholera and typhoid. Dr Hall, originally from Knaresborough in North Yorkshire, says the WHO has not been informed of any significant outbreaks yet, but says that could be because of the lack of communication with affected areas. "The telecoms have been down for a long time… the reporting systems are only just starting to get up and running," she says. "Mobile phones are given to health workers in the facilities and they SMS at the end of the day how many diarrhoea patients or suspected measles cases they have seen. We are not getting those reports yet." Another issue is that people with things like heart conditions or diabetes have gone without their regular medication for more than a week now. That will start taking its toll. "It's the lack of medication and care," Dr Hall says. "But also any event that puts such a stress on the population, you do see a rise in heart disease and stroke." According to the WHO, 28 international medical teams are currently in the Philippines but only eight of these have started work. At 21:00 GMT on Sunday, the WHO said another 14 were expected to be operational "in the next 48 hours". It says the Philippines government does not need any more foreign medical teams now, but will call on countries in the coming weeks to provide relief for current teams. One of the foreign medical teams is from the UK, sent by the Department for International Development. Half of the 12-strong team is now on board HMS Daring, which is heading to remote islands off the north of Cebu, where there has been limited medical help so far. The other half is heading for Tacloban, the scene of some of the worst devastation, where the medics are expected to arrive on Monday. Orthopaedic surgeon Dr Steve Mannion, a member of the team which left the UK last week, says they have been told what to expect in Tacloban. "There are people presenting with very badly crushed lower limbs which may need amputation," he says. "A week after the typhoon people are presenting with very, very badly neglected septic wounds and there have even been three deaths from septic wounds in the last few days." 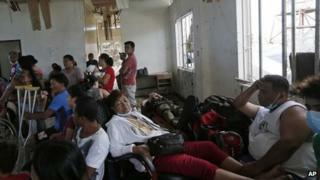 Many in Tacloban and in other more remote areas have still not received the medical care they so desperately need. Treating infected wounds remains a top priority to stop more people losing limbs, or dying from sepsis. Diarrhoeal disease outbreaks tend to start around 10 days after a disaster like this strikes. They can lead to extreme dehydration which can be fatal, especially in children. The medical teams on the ground are bracing themselves as aid teams continue to try to get clean water supplies up and running. The main islands affected were poorer areas of the Philippines. Many children are not immunised against measles or polio. A mass vaccination programme will start next week. The WHO aims to reach around half a million unimmunised children in Samar and Leyte.